There's a lot of chatter in this one. 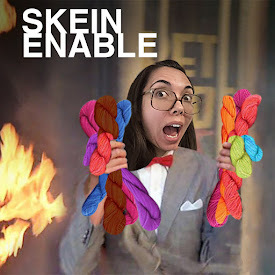 If you just want knitting content, you can say goodbye after the first 30 minutes! Michele finished her hat! It was the Tyson Beanie by Robyn Devine in Red Heart Team Spirit. Her Rav page here. She also started her Cascade baby cardigan by Raya Budrevich in Red Heart With Love. 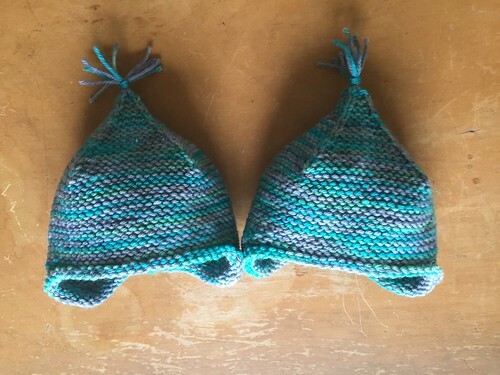 Jill made two little Garter Ear Flap Hats (pattern by Purl Soho) out of Nerd Girl Yarns Clever in Met Him on the River colorway. Her Rav page here. She's mostly finished the Sweet Pea cardigan by Mary Scott Huff in Knit Picks Comfy Worsted in Pea Pod. She's also given up on the Eliot-the-Elephant baby bib pattern. She's started the Maile sweater by Nikki Van de Car out of Blue Moon Fiber Arts Socks that Rock Mediumweight in a Rare Gems - Fire colorway. Michele is liking colorwork hats. She loves the Revespor Lue fox hat by Berit Lokken. She's also into The Force Awakens Hat by Mrs Luedeke LLC. Jill is into Ningyo, a colorwork cowl, by Thea Eschliman. She also likes Gocce by Paola Albergamo in the Knitty Spring & Summer 2016. Chris Jones "wardrobe malfunction" at the 2016 NFL Combines - I couldn't find a video that wasn't NSFW. You can do a google search but I didn't want to embed the video! Navel Gazing: True Tales of Bodies, Mostly Mine (but also my mom's which I know sounds weird) by Michael Ian Black.